bejoyful. - Oh, happy day! 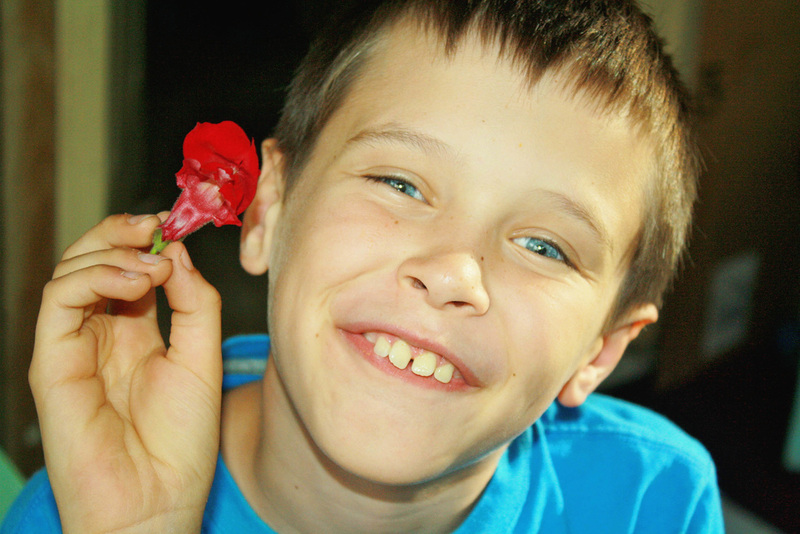 Mr. Mustard Seed recently made a flower for the boys and me. It was an easy and fun project. You can find more detailed / step by step instructions on Pinterest. 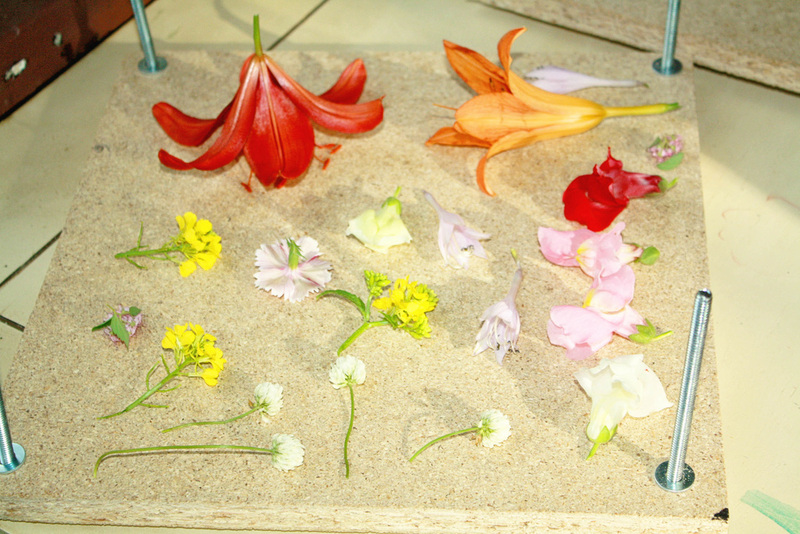 We've been having a lot of fun pressing flowers. We pressed these flowers about a month ago. They should be ready to use any day now. planning and prepping our upcoming school year. Thanks to those of you who've been especially patient with me. I'm still busy planning, but wanted to take time to share a freebie with ya'll! and I'd love to share them with you! 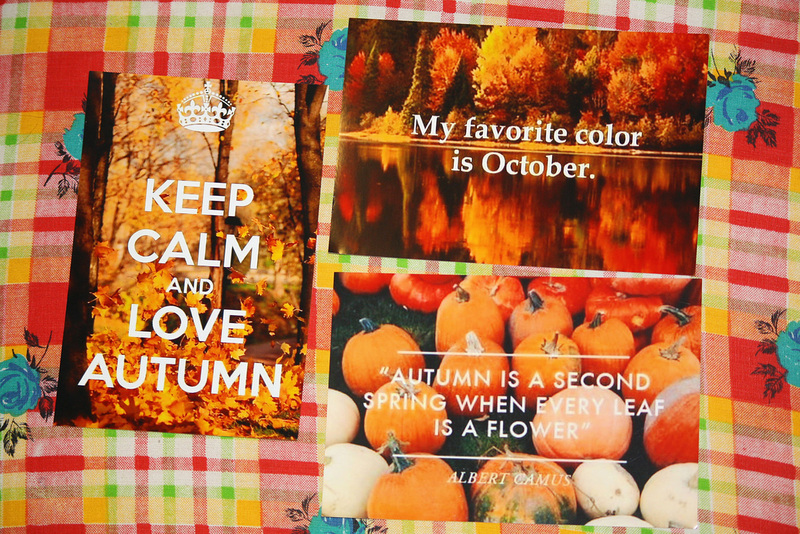 There are four- one for each season. The hope is to get you out in nature, exploring and enjoying God's beautiful creation. ​Each page has a spot to write the name of the observer (you! ), date, temperature and time. 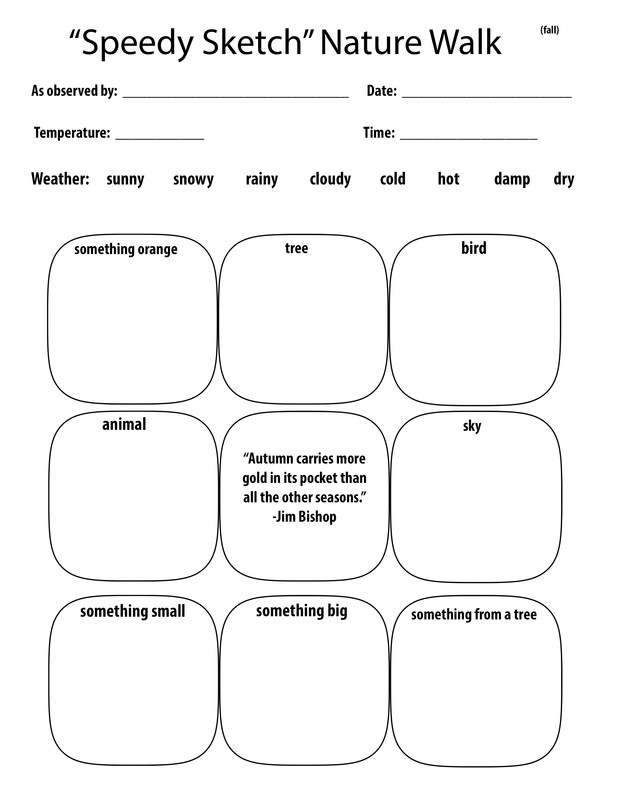 There's also a spot to circle descriptive weather words. There are 9 boxes on each page- 8 of which are part of the "speedy sketch" challenge. 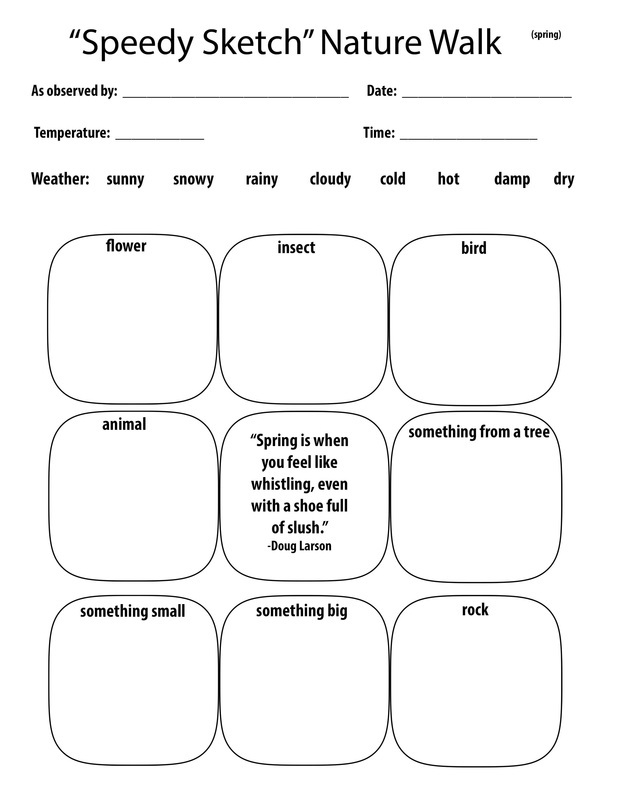 As you observe nature, draw or doodle a quick sketch in each box. 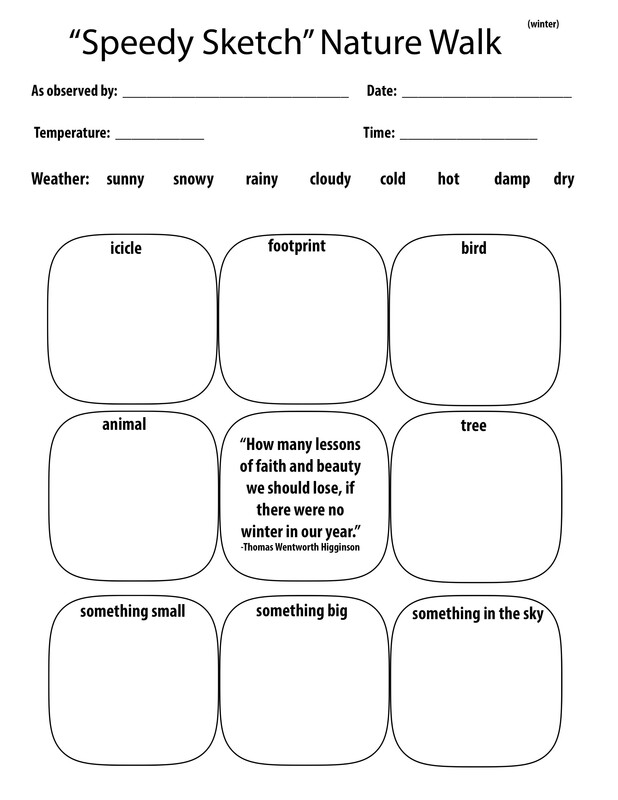 The middle box has a simple quote relative to the season. 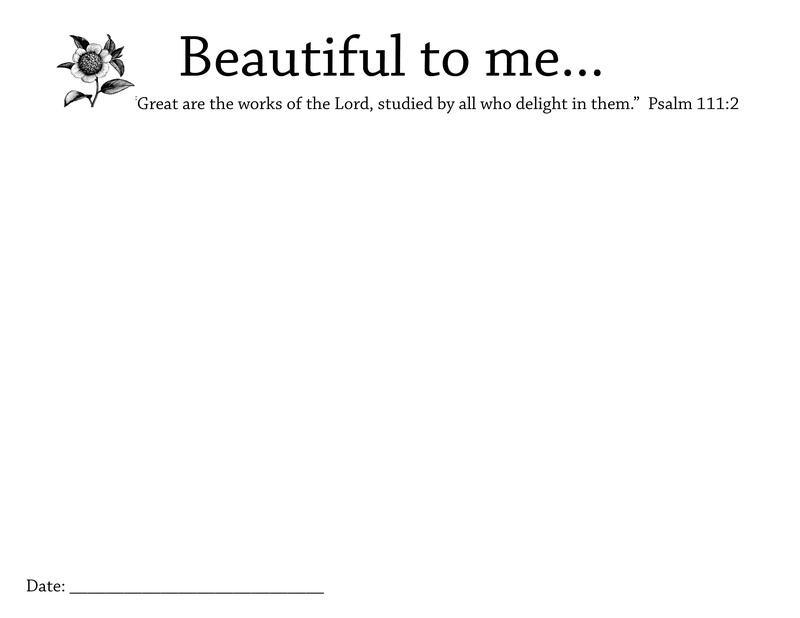 I've never done a downloadable freebie before, so this is all kind of trial and error for me. 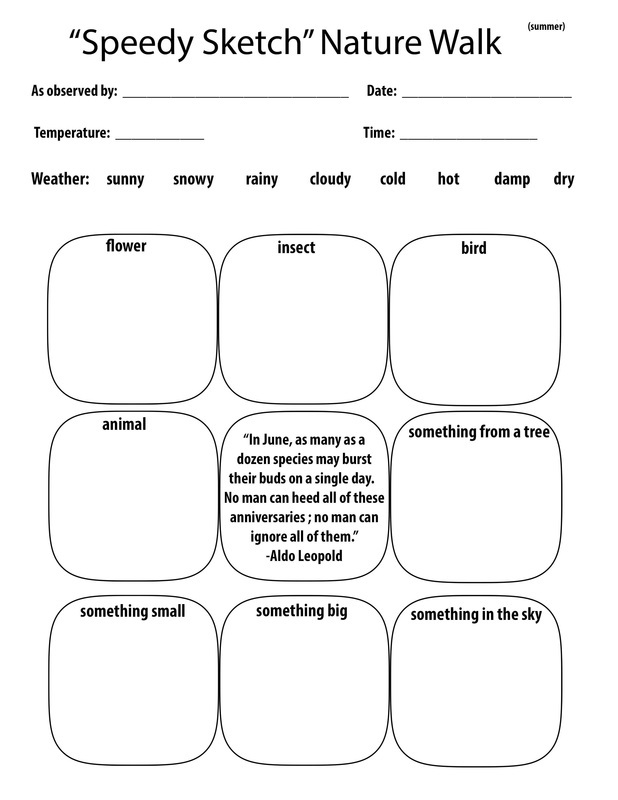 a "Beautiful to me..." nature journal page. Same idea as above, but with a little more space, and a little more freedom in your drawing. Get out there and explore God's beautiful creation - it's all around us! 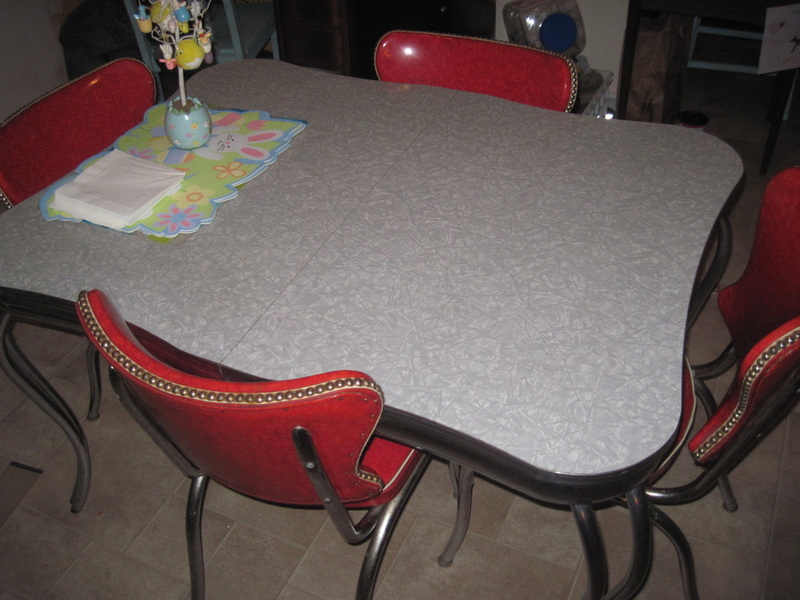 I'm so excited to share my new kitchen table with you guys! 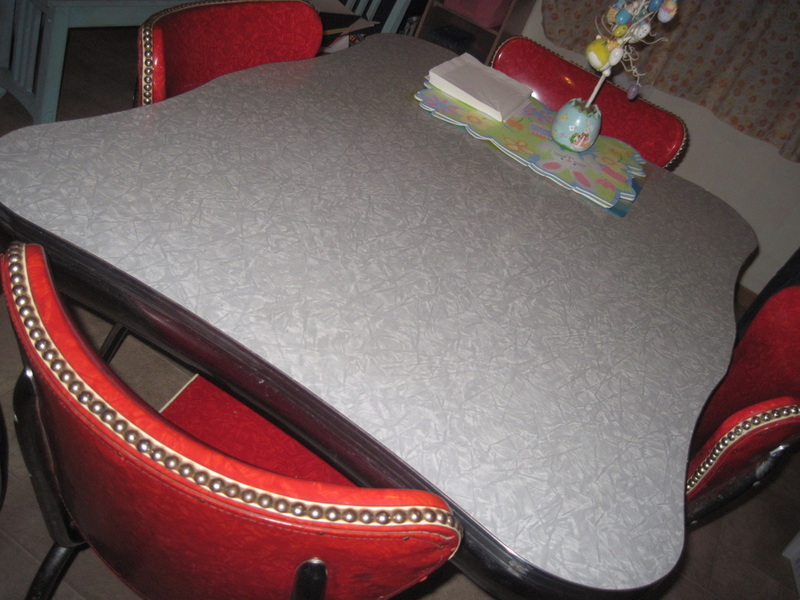 My mom and dad recently gave me my great great grandma's table. 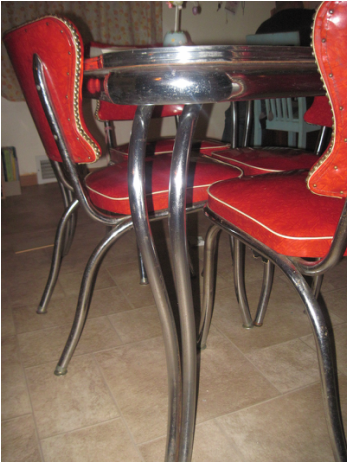 It's a 1950s formica chrome table. so I'm super excited about this. Yay! I spent some time cleaning it up tonight. with just water and tin foil. 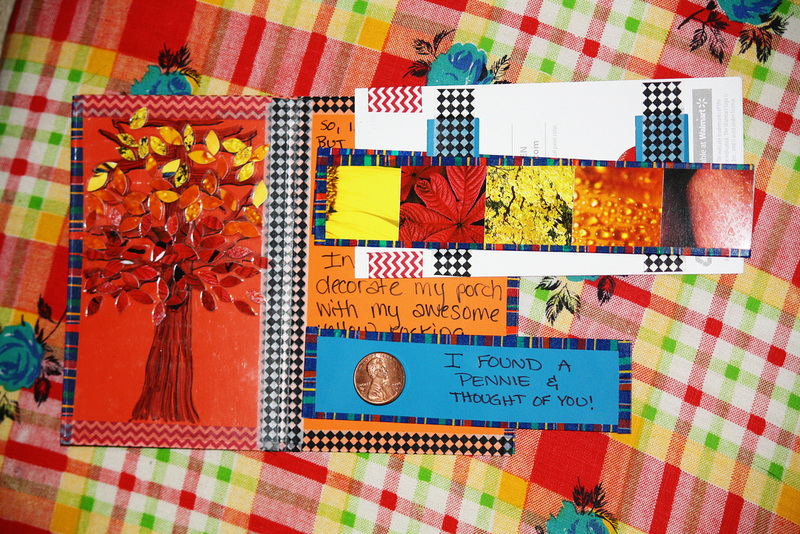 It's been awhile since I've shared a snailmail post! 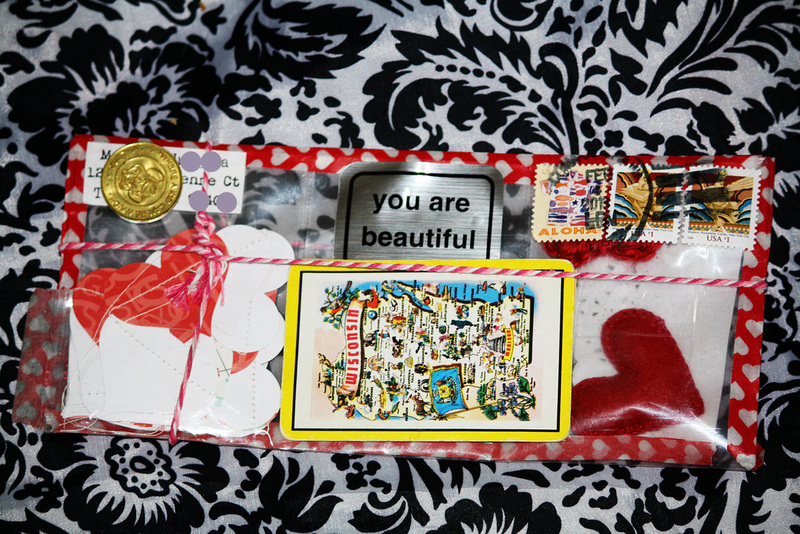 I'm happy to share some fun INCOMING mail with you today. I have the sweetest friends. I received this sparkly little bottle from a dear friend in Iowa. ...check out all of these pretty treats! 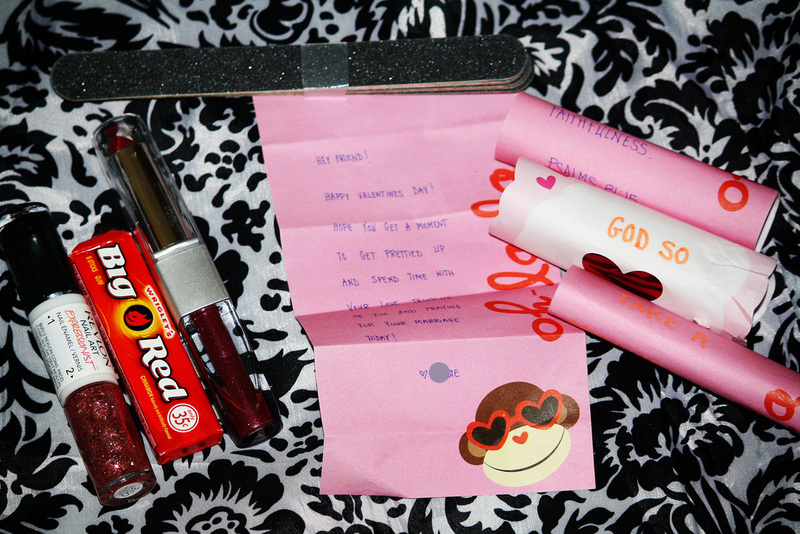 and a super sweet note, what will forever be kept in my treasure box. Thank you for your friendship, love and prayers, friend! it was amazing!! 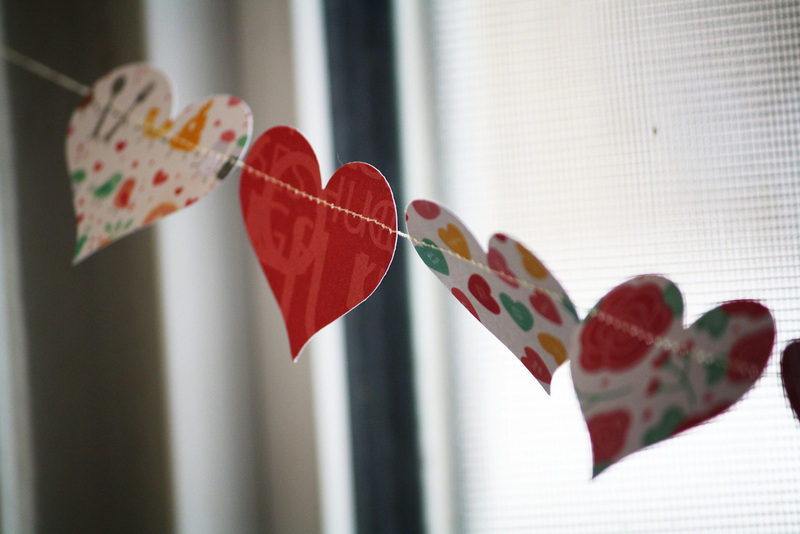 Totally see-through and filled with all kinds of Valentine decor. I think I skipped from my mailbox, all the way inside my house! I hung the garland in my dining room window. It makes me happy whenever I see it. You, my friend, are a treasure! And how about this cutie piece of mail from Holland?! I love the paper bag envelope, and white snowflakes. And the treats inside?! Fabulous! I can't wait to try the tea. It was great to read your news, sweet friend! You are so thoughtful and kind. "We'll be friends forever, won't we, Pooh" asked Piglet. Some treats from a new friend in North Dakota. I can't wait to make some of my own this Spring. It's hard to tell in this picture, but the leaves on the tree actually lift up. And I love how my friend sent me a penny. so it was really sweet. 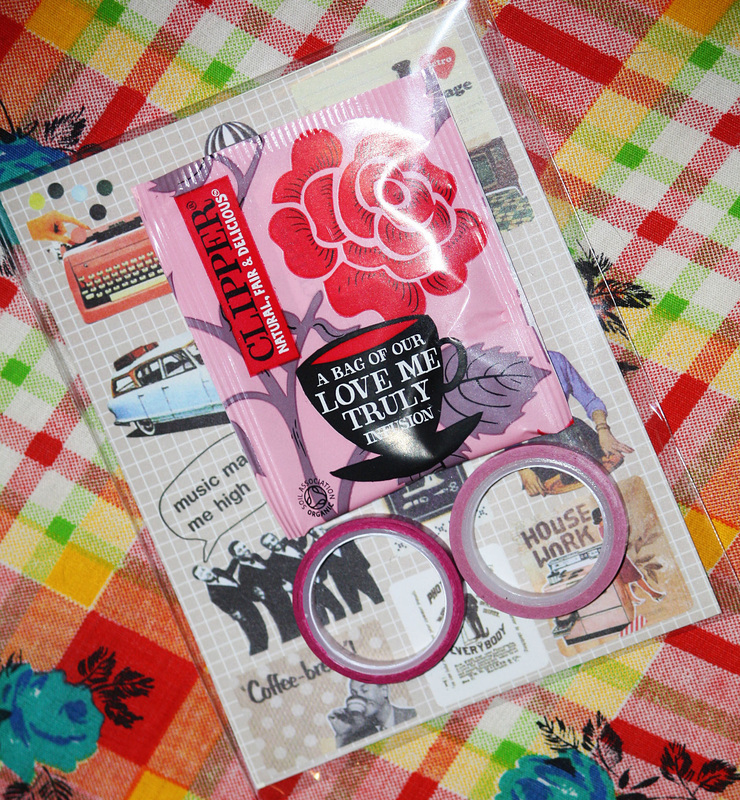 so my next post will show off some of my outgoing mail. A Valentine's Day card from my two nieces! They each wrote me a letter, too. and will one day be in my treasure box. I can't wait to write them back. I also received a really encouraging card from my friend, Casey. Thank you, friend! It's in my treasure box. I want to encourage you to take a few minutes to write a letter this week. by telling them how much they mean to you. and it will surely make their day. A Fun Way to Say "I LOVE YOU." For Christmas, we decided to surprise Mr. Mustard Seed with his favorite drink. Now, hiding numerous cans of Mt. Dew in our little casa is not an easy task. Mr. Mustard Seed uncovered the secret stash. Thankfully, I hadn't added our secret messages yet! notes from the boys, and even notes from the pets. 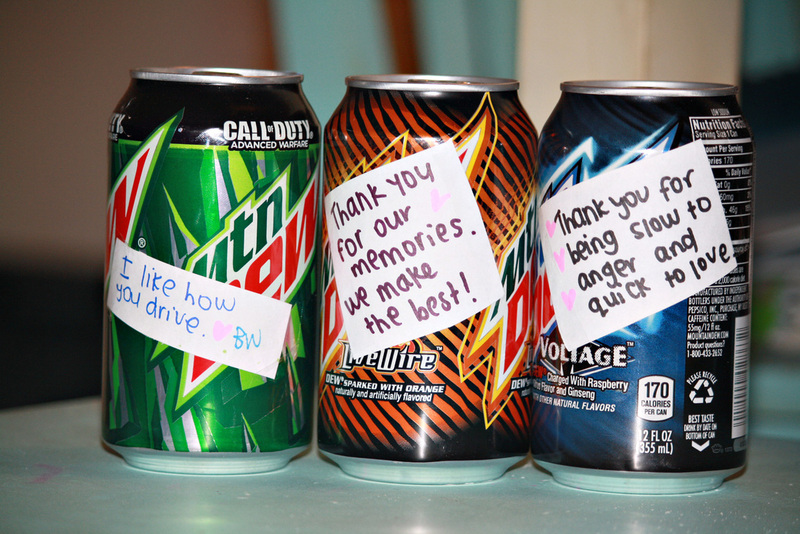 and we all enjoyed hearing him read the messages whenever he opened a can. I had a lot of fun making some special gifts for her. You can find them in the hardware section at Walmart. 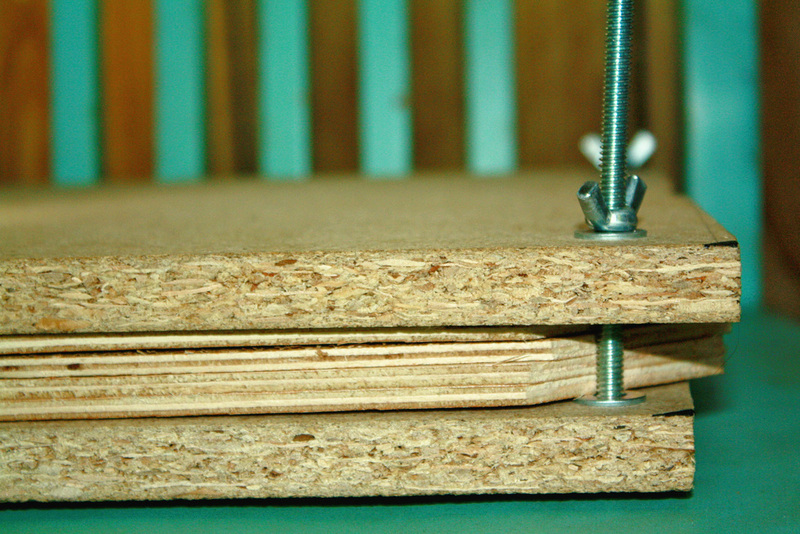 They have a screw-like bottom and a circular top. The circular top closes completely. If you're down with the spray paint, start by painting your dinosaur. After your dinosaur dries, just screw the circular screw thing into the top. This part is a little tricky, and requires patience and determination. As soon as it twists in a bit, it's easy peasy! Last step- slip it on the necklace, and you're finished! This is also really easy and really fun! a saw, and something to use for the background. 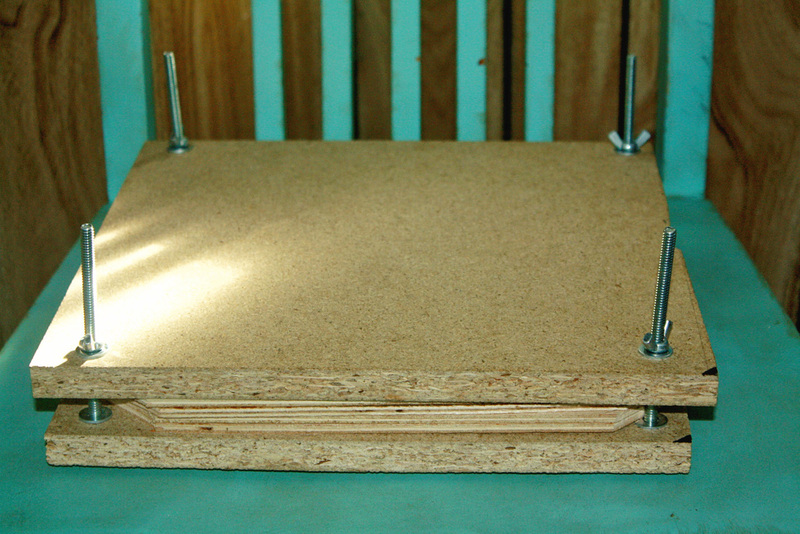 you may need push-pin sawtooth mounts, in order to hang it on the wall. The mounts can be found in the hardware section at Walmart. Oh, and you'll need a nail for hanging purposes! Start by spray painting your dinosaur and background. After they dry, use a saw to cut your dinosaur in half. 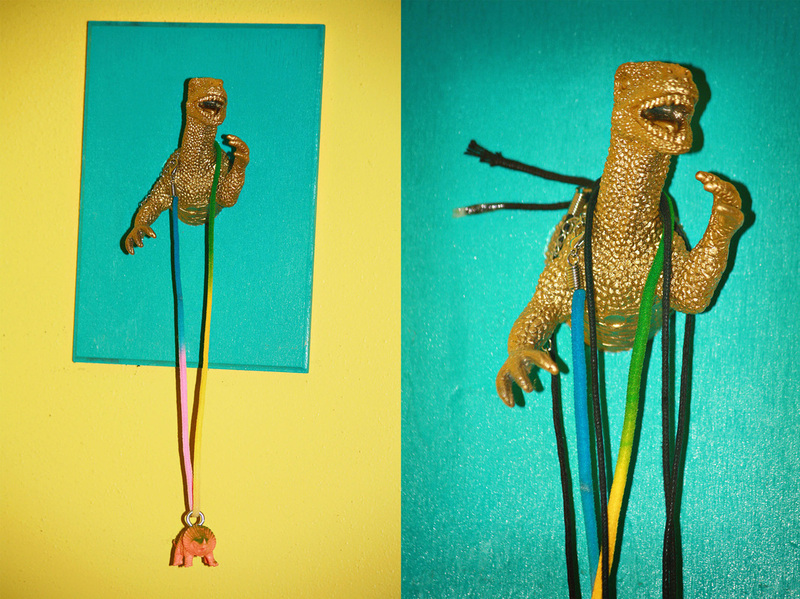 Hot glue it to the background, and you've got a fancy new necklace holder! (After I painted mine, I thought- "oh no!" I should have sawed first!" I tried Krylon and Rustoleum with these projects. They're pretty much the same price. Up until now, I've been using Krylon, based on that tutorial. This was my first time using Rustoleum and Krylon brands. I like the way it sprays, and think it covers better, too. it's really watery and doesn't cover very well. I had a hard time getting it to look good because it was so wet and bubbly. and it covered really fast and really well, too. Not to mention, I felt like a super hero, turning things to gold! 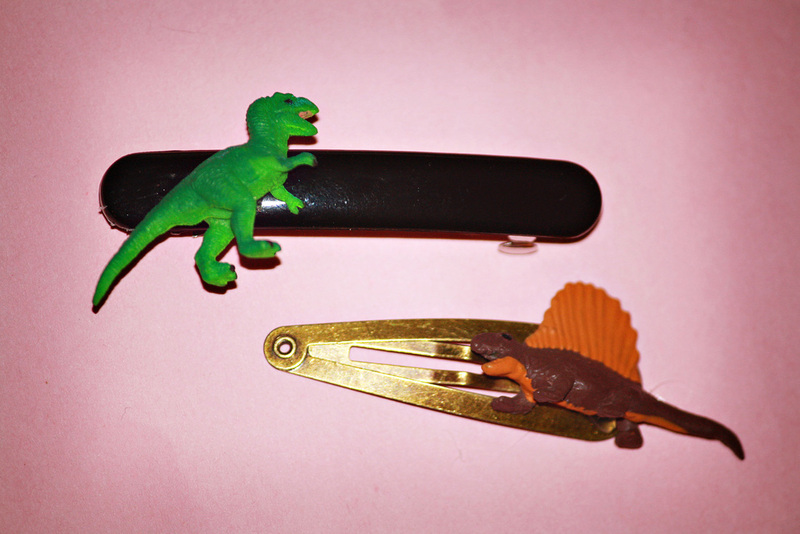 Some cute little dinosaur hair clips! You'd like to see even more surprises? Here are a few of the Party 'Saurs I made! Good ol plastic dinosaurs, spray painted and dressed up. It's a good thing, because these dinosaurs are ready to party! All set with a bone in the purse! I have one other purse (not pictured) that holds baby dinosaurs. 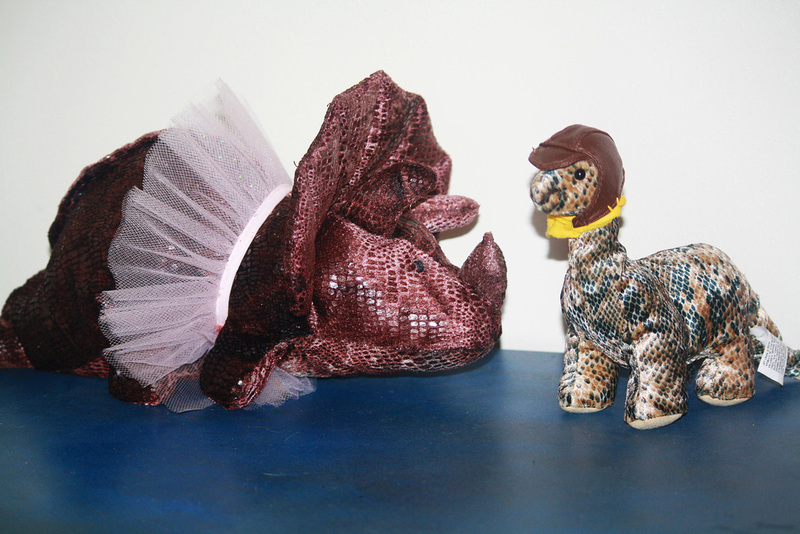 A few stuffed + dressed up dinosaurs. The possibilities are pretty endless with these projects. 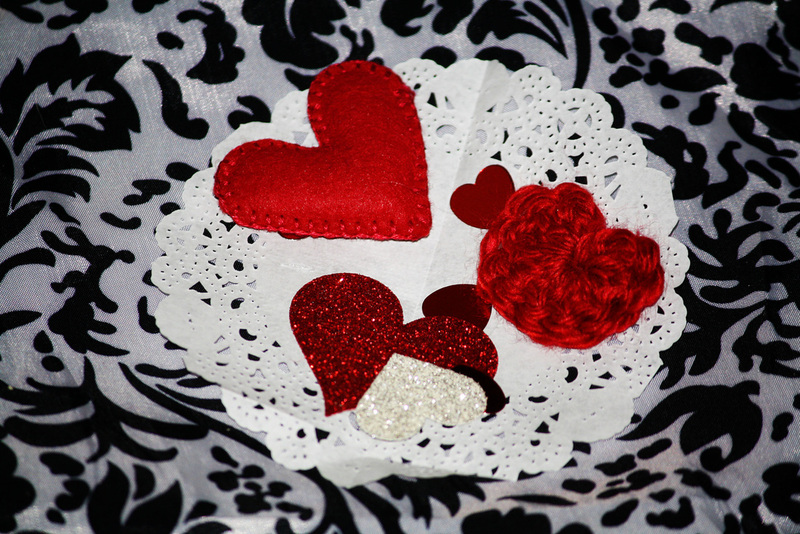 Get busy, create some art, and surprise someone you love! Photo Postcard + A Thrift Store Score! In the previous post, I shared a photo challenge with you. Last week, I had fun transforming some of my images into postcards. Trace your photo onto the card stock. Cut the traced area out. Glue the edges of your photo. Stick it to the card stock. Trim around the edges if needed. 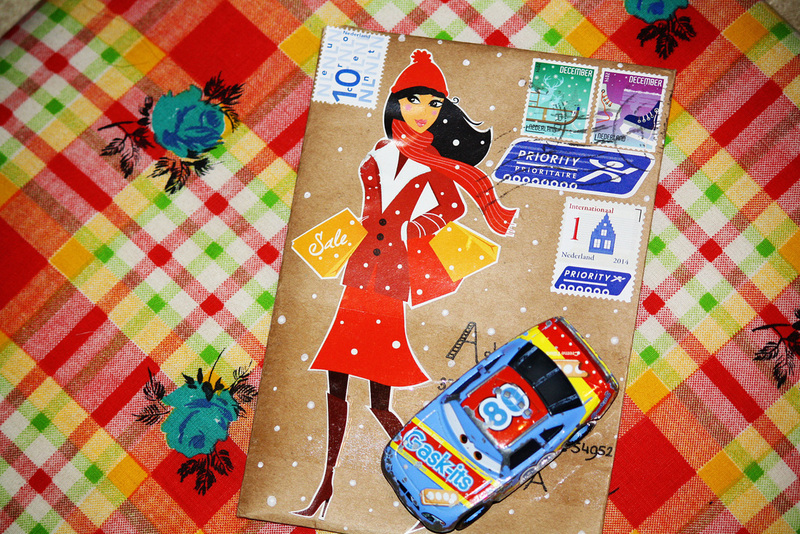 Place a piece of washi tape in the middle of the card stock. I used to make postcards like this for my great grandma all the time. It's a fun little project. Here's the backside of my postcard. My message is written with the purple marker. The address is underneath my Sharpie. 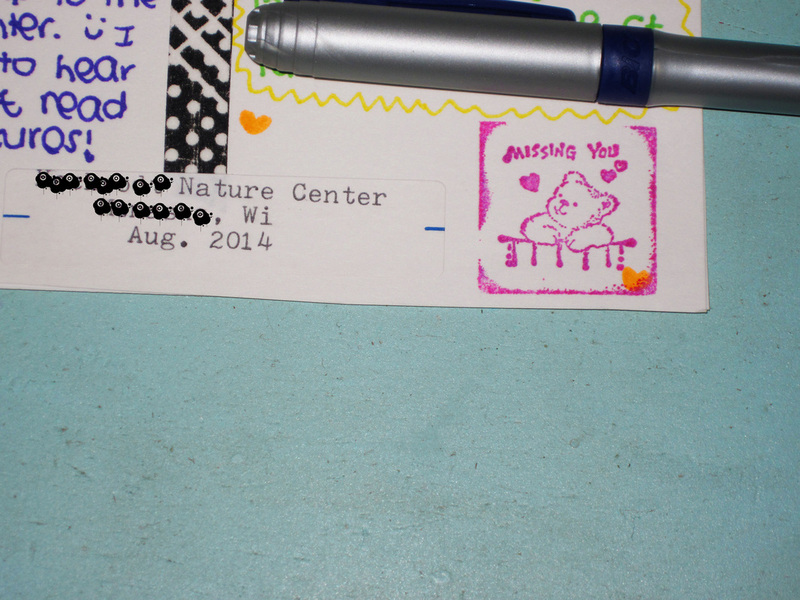 I used my typerwriter and a label to write details about the postcard. and wanted to use it, so I stamped it on, too. It added some extra fun color. Alrighty, are you ready for some REALLY exciting news?! Ya'll (should) know that I have a favorite thrift store. It's pretty much impossible not to find a treasure there. And, best of all- you "pay by weight." It really doesn't cost much at all. 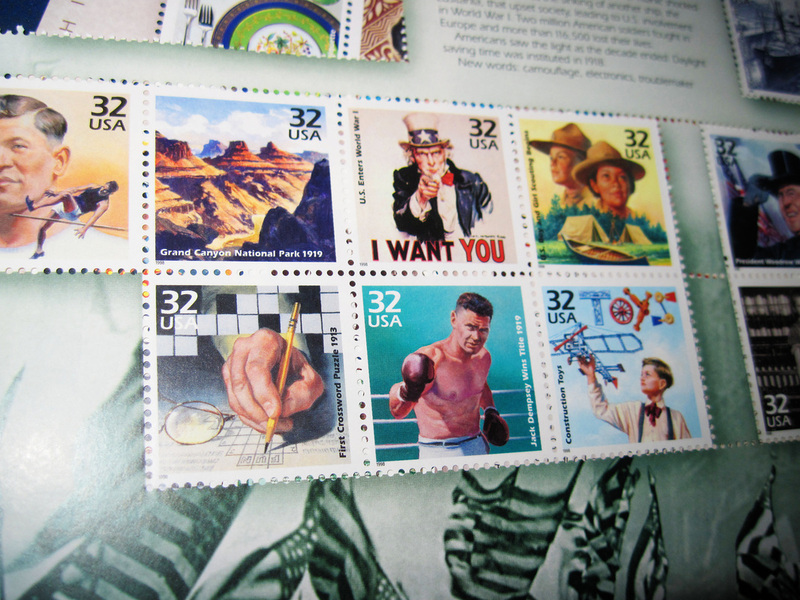 Well, Mr. Mustard Seed found a bunch of these postage stamps for me. All unused and all awesome! And, every sheet had different images on it, too! and paid about 5 cents for them. 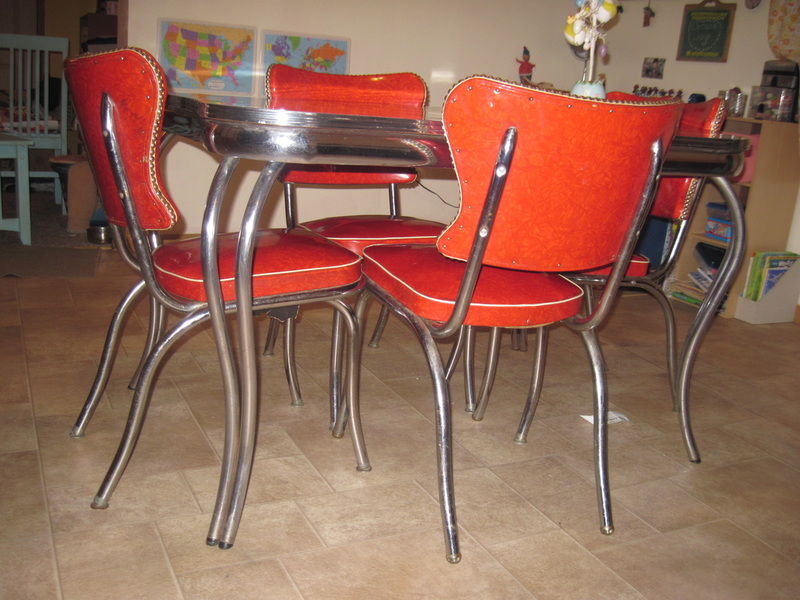 Now that's what you call a thrift store SCORE! 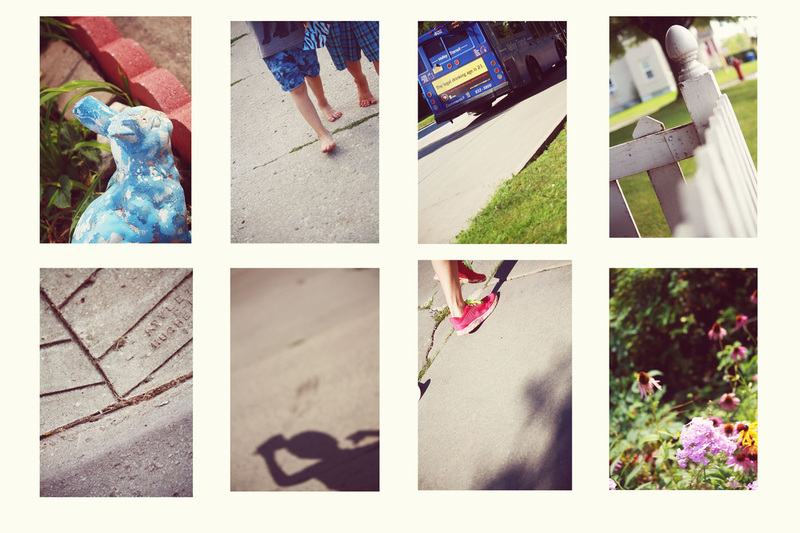 Photo Challenge- Walk with a Blind Camera. for Developing Self-Expressionwith Your Camera,"
by Steve and Carla Sonheim. Carla Sonheim is one of my favorite artsy authors. but I'm sure you can find it at your local library or on Amazon. challenge #6- "Walk With a Blind Camera." even Mr. Mustard Seed joined in! 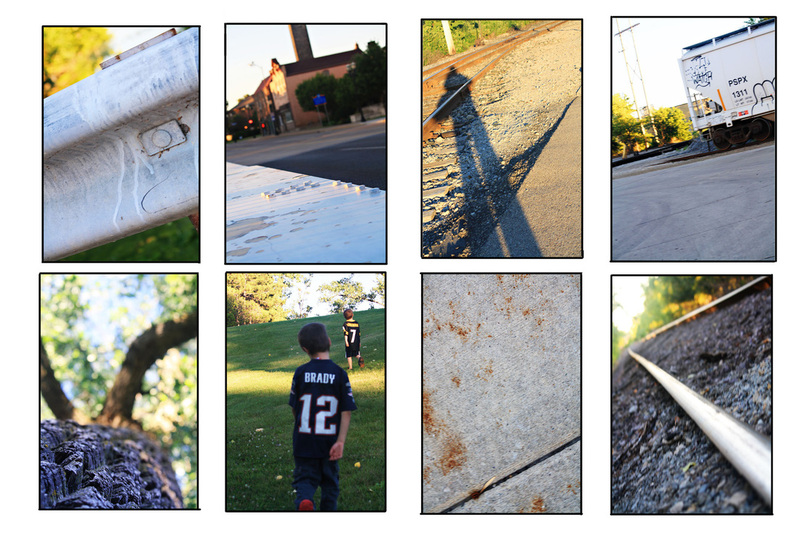 We each took a camera for a walk around our neighborhood. Mr. Mustard Seed brought a timer along, and set it for 5 minutes. and couldn't "plan" our shots either. The timer beeped, we grabbed our camera and snapped a shot. 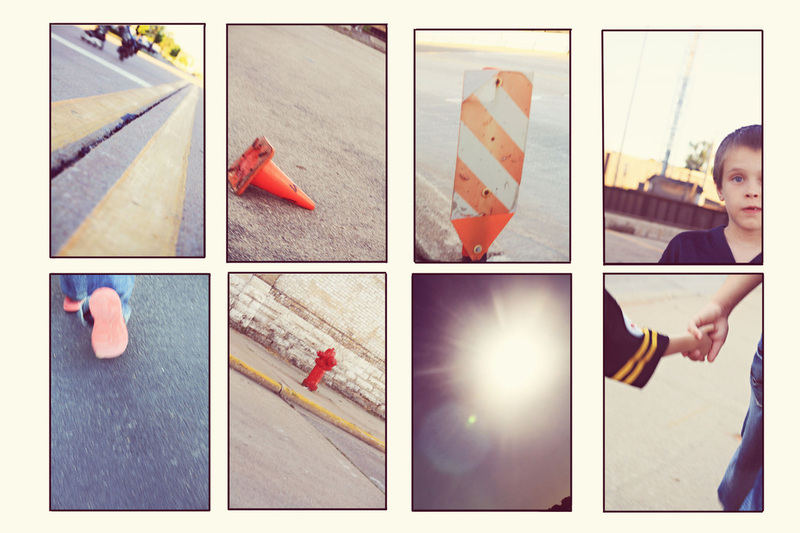 I used photoshop to organize and "collage" our shots a bit. and will probably turn some of them into postcards. You're about to come on a walk with us! because I am always "planning" my shots. We decided to do this two days in a row. The 2nd day, we set the timer for 2 minutes instead of 5. This was really fun, and something we'll definitely do again in the future! ​If subscribing, please see "Connect" page. Depending on which pages you'd like updates from, you'll have to subscribe to each page separately by entering your email on each page. Be sure to do this, so you don't miss any updates! :) Thanks for subscribing.